Home direct marketing direct-to-consumer P-Y-O pick-your-own u-pick Are you considering a pick-your-own experience? Are you considering a pick-your-own experience? Recently, the popularity of P-Y-O family outings has increased. It is no wonder. Consumers can enjoy not only the fruits and vegetables available for harvest, but they also get to experience some time on a real farm. Adding to this excitement, each month changes the availability of a different fruit or vegetable. As we know, what is available to pick varies on location, varieties planted, and weather conditions. To create a good communication stream with your potential shoppers it is important you remind them to always call the farm so they don't miss the products they are after or the times they are available to pick. In this part of the country we are finishing up blueberries and blackberries. Peaches, tomatoes, green beans, figs, raspberries and early apples are going full steam this month. Additionally, we are looking forward to more apples, grapes, pumpkins and winter squashes later this fall. 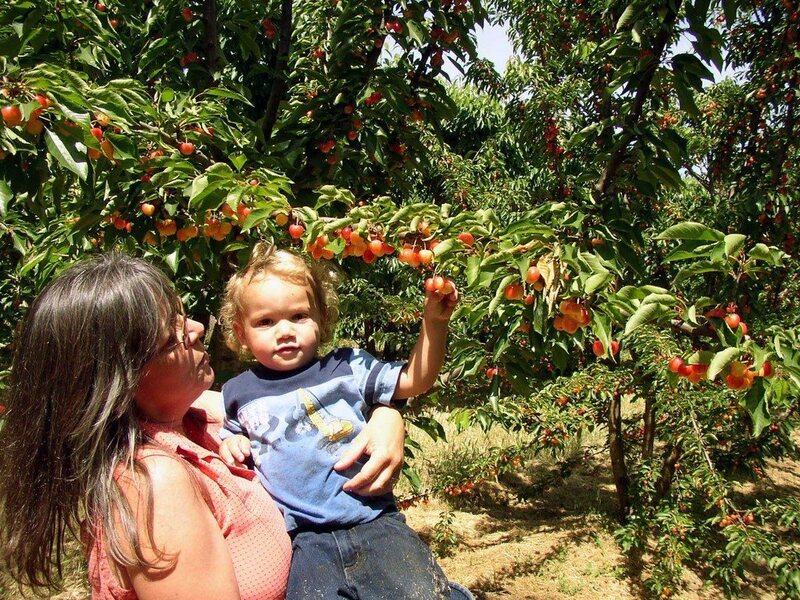 Pick-Your-Own farms offer fun for the whole family! Because the average consumer is three generations removed from living on a farm they may need a fair amount of education to make their P-Y-O experience most enjoyable. It may be beneficial if you remind your P-Y-O customers to bring snacks, hand towels and plenty of liquids to drink. Should they bring containers for picking and for carrying the fruit home? This can depend on the farm they are visiting as some farms provide containers. Should they dress in old clothes so they are comfortable and not worried about staining or tearing? How about suggesting a hat to offer protection from the sun? In the fall, extra layers keep them warm for picking. Remind them the value of sunscreen for the back of their neck and exposed skin. Also, be sure to tell them the fun doesn't have to end with just picking the fruit. Especially if your farm also offers hay rides, petting zoos, corn mazes, gift shops, picnic areas, or even some form of food service. Do you also sell pre-picked produce as an added convenience if children tire before the family has gotten its fill of fruit? Every farm is a bit different. Some have more relaxed rules, others are more strict. Customers need to find a farm that matches their needs - a farm with strict rules would not make for a happy experience with adventurous, young children. It is best to note and post all rules and regulations at your picking locations. Read a detailed story on an Ohio farm’s P-Y-O experience. the outdoors and a fun farm experience! Health codes usually require no pets in the fields. Always call in advance to find out if the fruit/vegetables you want are available, to get directions, check their opening and closing hours and to ask if children are welcome. Keeping the fruit cool is a good run of thumb. Check with your local Extension office for storage tips and provide some fact sheets to your customers. Be certain to plan ahead if you intend to market supplies to folks that plan to freeze, can, or make jam from some of their harvest. The risks of inviting strangers onto your farm and letting them roam about can be a challenge to control. However, with the growing popularity of pick-your-own farm experiences it may be worth your time and trouble to experiment a bit and see if this method of direct farm marketing is for you. For additional information on a great you-pick farm experience check http://www.pickyourown.org/.